What hath Trader Joe's wrought? 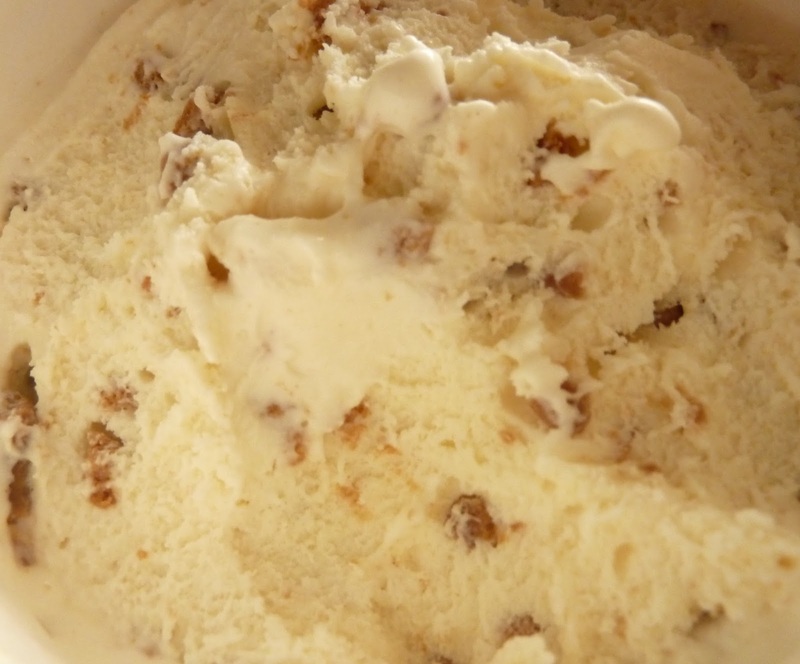 Cookie butter ice cream...is a thing. 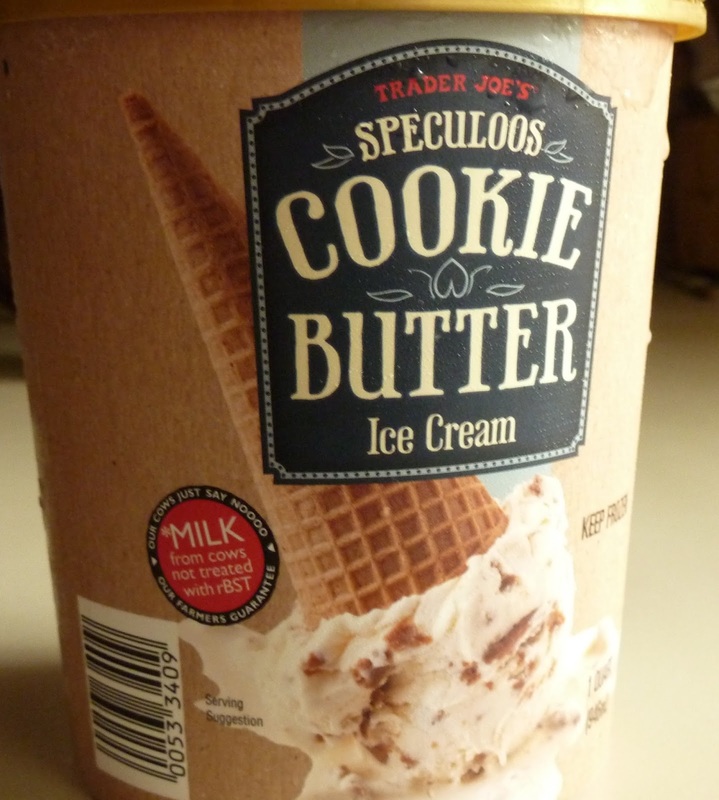 I repeat: there exists at Trader Joe's a product which is both speculoos cookie butter...and ice cream. Now I can die a happy man. A morbidly obese, yet happy man. It has a vanilla-esque base and it's full of speculoos cookie flavor. There are big globs of actual cookie butter throughout it. I couldn't figure out if it was the smooth variety or the crunchy. It strikes me as being somewhere in between the two, perhaps, but no...it's actually probably original. It's just firmer than usual because it's cold. Does it really matter? They make cookie butter ice cream. I repeat: the product in these pictures is real...and it's speculoos cookie butter flavored ice cream. What's next in TJ's diabolical plan? Cookie and Cocoa Swirl Ice Cream? Slap the words "cookie butter" on a Trader Joe's product, and you pretty much have a big winner every time...with maybe one exception so far. I started shaking when I heard the news. Sonia and I started calling all the TJ's in our region to see who had it in stock. As I mentioned in my last post, Sonia and I just moved. And thanks to the customer service wizards at Comcast, we were without internet for a few days. A big thanks to Russ for holding down the fort during our transition. We're still buried beneath boxes and swamped with address changes, phone calls to realtors, and new utility accounts, but the magic of the interwebs floweth once more to bring you good tidings of great cookie butter. This ice cream is on par with the discontinued classic Lemon Triple Gingersnap Ice Cream—and maybe even exceeds it in some ways. It's a legend, in every way fit for the halls of the Pantheon. It really actually honestly seriously tastes just like the original cookie butter, and it blends perfectly with the sweet ice cream surrounding it. Sonia says it could use just a bit more in that gingersnappy, cinnamony department. And I agree, it does err on the side of sweet, rather than spicy, but I think it works. I think the flavor is perfect. If a madman held a gun to my head and forced me to make a complaint about this product, I'd simply ask for larger globs of cookie butter in the mix. But until that hypothetical lunatic starts waving his Glock in my direction, I'm sticking with my story that this is a near-perfect product that just needed to be here on Earth right now...even in light of its $5 price tag. From the bottom of my heart, Trader Joe, thank you for making Cookie Butter Ice Cream. I give it a perfect 5. Sonia gives it four and a half. 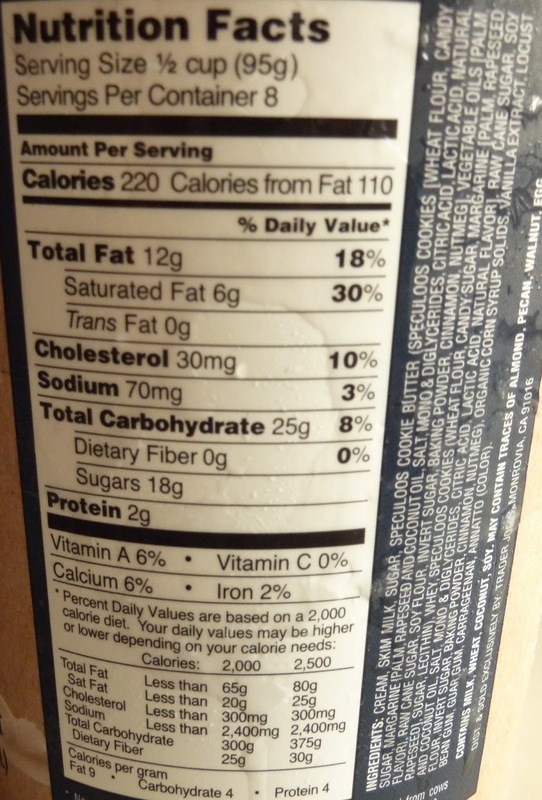 Sounds delicious, but it does contain margarine, yuck! (As does the regular Speculoos Cookie Butter). I'm LITERALLY making a TJ's trip right now just because of this post. In sad news, they discontinued the Lemon Triple Gingersnap??? They came around with a sample. Tasted like gingerbread. They offered me another sample later. I passed. Ha! I've been mixing my Cookie Butter with vanilla ice cream for a long time now. Must try this! I really wish I could find the video clip! OMG. Heaven. May I also note it makes a darned fine milkshake when blended with 1/3 milk (unsweetened vanilla almond or regular cow), a shot of Haitian rum, 1/2 very ripe banana and a dash of cinnamon? I DEFINITELY need to try that. That's a crazy idea...but it just might work! Might try mini-sandwiches, cookie butter ice cream and lemon curd between two ginger snap cookies! I was wondering if I could use your photos from this post in an article I am writing for spoonuniversity. com. I would credit you of course! Let me know what you think. Thanks! I completely disagree. This ice cream is good, if you like vanilla. It's pretty expensive considering you have to buy an entire jar of Cookie Butter and mix it in just to make it taste good.